The Zoning Committee of the New York City Council is holding a hearing today for NYU’s proposed expansion. It is the last stop on the ULURP tour that has garnered some of the most contentious debate in a neighborhood that has seen more than its share of zoning upheaval over the past year. Usually the council votes in agreement with the council member representing the district. 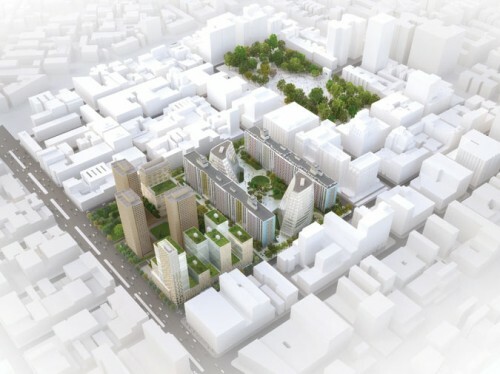 As such, all eyes were on Council Member Margaret Chin, whose Downtown district includes the Washington Square area where the expansion is being proposed. While Chin said that the plan is “unacceptable as it stands” she didn’t outright reject the plan. According to The Wall Street Journal, Chin is casting a critical eye on the so-called Zipper Building on the southern super block. As the university agreed with City Planning to eliminate a hotel in that building, it seems likely that’s where the ax will fall. Borough President Scott Stringer, whose role is advisory, said that he had already negotiated a reduction in the Zipper Building, but City Planning set aside his suggestion. This morning Chin added affordable housing to the list of her desires, opening up yet another round of arm twisting for NYU. Whether the housing would be included on the site or within the district is unclear and whether that agreement would be binding will probably be a sticking point for the ever-vigilant Villagers. Open space was also on the Council Member’s radar, but her mention of preserving park space along the DOT strips along Mercer and Laguardia streets was already mapped out by Planning. However, Chin’s mention of the “thousands” of jobs that the project will bring indicates another mildly altered version of the plan will move forward. For their part, NYU stuck to the script. As an example of a university busting at the seams, President John Sexton noted that the university’s library should seat 8,000 but could only accommodate 3,000. He countered claims that expansion was an attempt to fill college coffers with cash from more students, saying the expansion was physical in nature and would not correspond with a substantial growth in the student body, which he predicted would only increase by half a percent annually. He also defended the contention that the university couldn’t afford the project. “We wouldn’t be taxing our budget any more than we have over the last then years,” he said.